Tsipras and Zaev agreed; the US, NATO and the EU applause. That phrase can describe the recent agreement between the governments of Greece and the Former Yugoslav Republic of Macedonia regarding the decades-old name dispute. “We have a deal” said Prime Minister Alexis Tsipras yesterday in a televised announcement, describing the accord between the two countries on the name “Severna Makedonija” (Northern Macedonia). But what kind of deal are we talking about? It is actually an agreement tailor-made for the aspirations of NATO and the EU, as long as it unlocks the accession of the Former Yugoslav Republic of Macedonia in the two imperialist organisations and consists a desicive step towards the deeper presence of NATO in the Balkans. In his public message, Alexis Tsipras himself admitted that, as long as the deal is implemented, Greece will lead the efforts for FYROM's accession in the EU and NATO. The words of the Greek Prime Minister confirm, in the most official way, the role of Greece's bourgeois class as a promoter and provider of the NATO-EU interests in the Balkan peninsula and in the broader region of eastern Mediterranean. The SYRIZA-ANEL government's haste to reach a deal in the name dispute and to accelerate the process of FYROM's membership in NATO and the EU echoes the plans of the Greek bourgeois class to deepen her economic penetration in the region, for new profitable investments. Through this way, the Greek capital aims in advancing its position in the imperialist competitions. cannot hide his pleasure for the agreement. 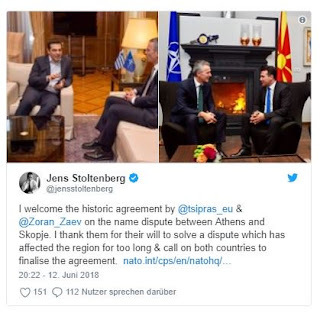 The question which arises is the following: Who wins from the agreement between Tsipras and Zaev governments? Certainly, there is no benefit for the working people in Greece and “Northern Macedonia”, as long as the second's accession to NATO will mean further insecurity and instability for the region. The role of the imperialist alliance of NATO in the destruction of the Balkans is well-known and the memories from the US-NATO-EU bloodshed in Yugoslavia are still fresh. Furthermore, the acceptance by the Greek government of the terms regarding “Macedonian” nationality and language is grist to the mill of nationalism and irredentism. The sole winners of the name deal between Athens and Skopje are the american and european imperialists, as well as the large business groups which are definitely thrilled by the perspective of new fields of profits, at the expense of course of the working people in both countries. The workers, the people of the Balkans, no matter their ethnicity or religion, have no interest to line themselves under the false bourgeois flags of nationalism or cosmopolitanism. The only way out from this trap is the strengthening of the anti-imperialist struggle, for the disengagement from NATO and the EU, with the working class in power.